We have Shell Cracker booked. My wife Juli and I plan to make the trek from Tennessee. I doubt we will have a kid in tow, unless I can talk my daughter into visiting the University of Florida. UF is a wonderful place! Florida was on my short list way back when (Florida, Georgia & Ole Miss). Florida has been on a tear in terms of academic quality and prestige as of late -- currently the 8th best public university (US News). My daughter just associates greater FL with what she sees in the panhandle when we vacation there. Rollins is where I need to get my next job after I get my kids out of college. I could see going to work there. We will have to discuss this Larry! Jerry, You and I both know that Athens is Gods country. Go DAWGS! "God don't need a degree Mr. Morfoot"
Okay Gang...It seems that Paramores is filling up for the event which is awesome to see. At the time of this posting there are only 6 cabins left, two Tent spaces and quite a few RV spots left for SJRR 2019. Looks like another grand River Ruckus is on Tap so tell Santa to reserve you a spot on HQ as Spring will be here before you know it. Start off the boating season with your fellow CCFans and we'll see you on the River! Best to be right there at Paramores, but if late to the dance, there are a few other places nearby if need be! 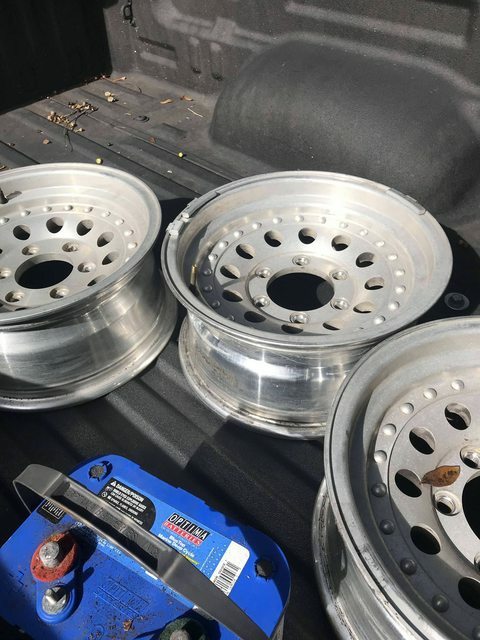 Anybody going to SJRR interested in 3 6lug aluminum wheels? Not too many single axle trailers with 6 lug hub so I won’t bother posting on CL. Free or they go to scrapyard in a week or so. CC single axle trailers from 1985 forward are 6-lug. I was thinking trailers other than CC/Ramlin. Does this mean a Todd sighting at SJRR ? SJRR usually falls on my quarterly trip to Alcatraz inlaws in VA only to be reminded of how much of an @$$ I evidently am. I’m really pumped as you can tell. But I can arrange drop offs at boat show for sure or probably parramores too. Happy New Year everybody....The Farmer's (Mike, Marsha, Michael & Mason) are in!! Thursday-Sunday. We will be bringing ribs for the Saturday cook-out! Been wondering when you were going to "chime in"!! Looking forward to seeing you! What about your friends with the Center console? They are a tentative yes right now due to a work project, but will have a definitive commitment by February they've told me. We're all looking forward to a great time!!! Looks to be shaping up for a wonderful 10th anniversary of the SJRR with newcomers to the gathering along with some seasoned veterans. Daughter got me a mini drone for Christmas so I hope to be good enough with it by then to get some great aerial shots of the Ruckus! Happy New Year CCFans! I just wanted to let everyone know that as of this posting 6 cabins, 2 tent sites and 13 RV slips are left for the event. Parramores is filling up with CCFans I hope so if you're coming then ya better get moving. I'll send out another reminder to the Classic Correct Craft Group on FB this Sunday but giving CCFans Dibs on what spots are left. Get it in gear fellas! I was asked my Scott Z if I was gonna do shirts this year and I said probably not as I still have Ruckus Coozies left over but it is the "10th Annual River CCFan River Ruckus" so I need some feedback from y'all. Dana at Action Screen printing needs minimum 3 weeks notice if we're gonna do shirts so do you folks heading down for this want to do T-Shirts? If so I will tell Action Screen to go ahead and will ONLY order what is needed. I'm not carrying around extra shirts for 3+ years as TimBob is trying to downsize his residence.. If there's interest then we'll do them and IF I can get sponsors involved there will be little or no cost to y'all. If you have a business and wanna be a sponsor for the Ruckus then send a message. Business logo on the back of the shirt if we do them so thanks in advance guys and gals. "10TH Annual" Got to have T shirts!! We would be in for 2. Glad youre back with us. Gail and I have decided to attend . The bad news is the mustang is no way going to be ready . So I will bring what I got Its at least got the heart or a Correct Craft. Tim I will take 1 XL and 1 Med T shirt if you get them.